The sermon was preached on November 24, 2013, by Dr. Bill Nieporte, at the Patterson Avenue Baptist Church in Richmond, VA. You can read the manuscript below, or watch the video (the link comes up after this little note. You may also visit the church website at http://www.pattersonavenuebaptist.com and listen to the MP3 or subscribe to our weekly podcast. Today is the last Sunday on this year’s Christian liturgical calendar. Next Sunday we begin a new church year of worship and celebrations with our Advent focus in preparation for the celebration of Christmas. This last Sunday of the Christian calendar focuses on a celebration remembering Jesus authority over all things. We call this day “Christ the King” or “The Reign of Christ” Sunday. Whatever we call it, the message is the same. Jesus Christ is Lord and King. So the text selected for the day may seem odd. As we have been taught to define the word AUTHORITY, it hardly seems fitting to associate that world with the cross. They hung a sign above Jesus head on the cross declaring him KING, but that notice was meant as sarcasm. We do not think of the image of one writhing in torturous pain having anything to do with AUTHORITY. When we think Jesus as AUTHORITY, our mind might wander to the accounts of his amazing miracles: walking on water, healing the sick, giving site to the blind, cleansing lepers, raising the dead. We would not picture Jesus on the cross and think of AUTHORITY. You and I do everything we can to avoid suffering. Only those whom we might define as mentally ill would intentionally do something to harm themselves. The bigger our tragedy, difficulty, or hardship – the harder it is for some of us to believe. We a going along through our days, minding our own business, seeking to do good and to avoid doing bad. Then, out of the blue, we lose a job. Or we become ill. Or a family member dies. Sometimes all those things happen in rapid succession. When we suffer the visceral response from most is to imagine that God is either angry or powerless to make a difference. There is a third option. The message of the Gospel is that God becomes one of us among us in Christ. The message of the Gospel is that on the cross God comes to us and embraces us all in the mess of our lives – in our suffering, sorrow, struggles, and sin. God embraces our brokenness and take us and all that pain into himself – and reveals His authority even over all the things that made us feel broken and helpless. God is not angry with us at the cross. God is not avoiding us at the cross. God is not powerless at the cross. On the contrary, God is revealing that he comes to us in the brokenness of our humanity to redeem us, heal us, to like, love, accept, include, and adopt us. The cross does not reveal a God who is powerless, but rather it reveals a God of tremendous power – a God of magnificent AUTHORITY. In the scripture for today from Luke’s Gospel, Jesus speaks two words from the cross. First, he speaks first to his Father. Secondly, he speaks to one who hangs on the cross next to him – metaphorically, then, he is also speaking to each of us. In Jesus two simple statements, he reveals his AUTHORITY from the cross. We know what happen. Jesus was unjustly arrested, unlawfully tried, and unfairly condemned. He is beaten and abused and a crown of thorns was crushed into his brow. He hands and feet were nail to a cross, and he was left to die in naked shame and torturous pain, while being ridiculed and insulted by the religious folks who were centrally responsible for this miscarriage of justice. His response is unusual, to say the least. Consider what you would do in a similar circumstance? 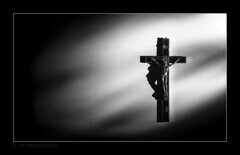 I become outrageously angry and offensively defiant over far less that the cross. How about you? Somebody cuts us off in traffic…Somebody offends us in the workplace…Someone shocks or sensitivities with what we consider to be uncouth behavior…Somebody offends us or insults us or get’s under our skin. What do we do? In our hearts and minds we pray that God might rain fire down upon them from the heavens. We talk about and sometimes to them with insults and judgment. When that happens, here’s what we are doing. We are giving people the people the power to get under our skin. We are giving these folks authority over our thoughts, feelings, and emotions. We walk around with a chip on our shoulders and imagine that while we are griping and complaining that we are POWERFUL, but in reality we are revealing ourselves to be weak. Jesus does not give up his AUTHORITY at the cross, he reveals it. He affirms that even in that mess he is not disconnected from his Father whom he called Abba. He affirms his identity as the one who has come to SAVE US, but praying that we be forgiven. He did not submit or surrender. Neither did he retaliate and seek vengeance. He remained true to who he was. He refused to turn his power, will, and authority over to those who nailed him to the cross. Jesus chooses a different alternative, a regal one, that shows his cross is not a trap, but a throne. He forgives those who are mocking him, shaming him, killing him. They condemn him by word and action; he prays for them: “Father, forgive them; they don’t know what they are doing.” He forgives their ignorance –– their hardness of heart, their thirst for blood, the moral blindness which allows them to put to death the author of life. Why does he do this? Because he sees them for who they truly are. Not powerful people, but people weak, ignorant, blind, and fearful. In the midst of his execution, he recognizes how miserable are their circumstances. At the same time, he declares them redeemable. That is power. That is AUTHORITY. That’s not the lesson. The lesson is that OUR BROKENESS AND SIN took Jesus to the cross. Yet from the cross Jesus prayed for us, saying, “Father, forgive them.” At the cross Jesus revealed the regal AUTHORITY of one who came to redeem us all from our sin and brokenness. At the cross Jesus prays for us! We often draw a dividing line between these two men. We see them at the good criminal who repents and the bad criminal who mocks. I wonder if it is not that easy. Jesus does respond to the OTHER criminal. “Lord, in your KINGDOM, remember me!” Notice the word KINGDOM. That is an acknowledgement of Christ’s authority, is not? Jesus says, “Today you will be with me in paradise!” In so doing Jesus is again revealing his AUTHORITY from the cross. Get this…one of the things we notice about Jesus is that he always made the most of every opportunity. No one slipped past his love and his grace embrace. Look at the events of his life! He spoke of redemption to a religious leader named Nicodemos who was so fearful of being seen with Jesus during daylight hours that he came to the Lord under the cover of darkness. He spoke of living water to the ostracized woman he met at a well during the high heat of the day. He brought healing to a band of lepers – one of them a Samaritan – whom his own religious traditions taught should be excluded and rejected. He welcomed into his company and fellowship a traitorous Chief Tax Collector name Zacchaeus. Jesus reveals his AUTHORITY to seize the opportunity to respond to one man’s simple expressions of faith. The cross did not stop Jesus from the AUTHORITY to express love. In point of face, the cross was the penultimate expression of that AUTHORITY – of that love. We are in good hands, too. We are in the hands of the one whose love undergirds the universe. We are in the one who expresses from the cross the AUTHORITY – the power – of redeeming love.